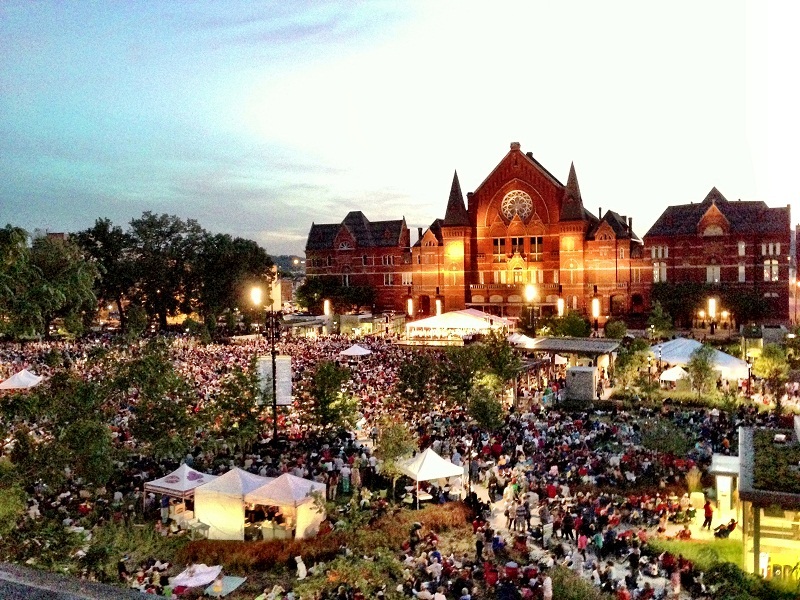 In welcoming Louis Langrée, the new music director of the Cincinnati Symphony Orchestra, Over-the-Rhine hosted LumenoCity, a community-wide celebration which encompassed all five of Music Hall’s fine arts groups as well as the building itself. Performances included the Cincinnati Pops, Ballet, Opera, May Festival Chorus, and of course, the Symphony. The ensemble was complimented by a light show that used the façade of Music Hall as a canvas. Projections synchronized with 40 minutes of live music, with song selections ranging from Tchaikovsky and Beethoven’s Symphony No. 5 to Broadway hits including selections from Les Miserables and Hairspray. An estimated 15,000 spectators gathered at Washington Park Saturday night, and another 18,000 on Sunday, to witness this first-ever light and orchestra music spectacular. A few seats away, Devon Marshall had traveled from Price Hill with his family to see the show both Saturday and Sunday. Each day, they parked at Union Terminal then took the free shuttle to Washington Park. Despite there being long lines for the shuttle after the show, Marshall appreciated the service. “If Cincinnati keeps having events like this, we’re going to need that streetcar to help get people around,” he grinned. With over 30,000 people in attendance this weekend, LumenoCity became the largest gathering in Washington Park, dwarfing the sizeable turnout for last year’s World Choir Games performances. As Over-the-Rhine’s revival continues to succeed, Cincinnatians look on with wonder as to how the historic neighborhood will impress them next. Paige Malott and John Yung contributed photographs for this story. Next articleCan good design of our communities make us happier?